NEBNext Direct employs a unique hybridization-based enrichment workflow that hybridizes baits directly to genomic DNA, without the need for upfront library preparation. The BRCA1/BRCA2 panel demonstrates extremely high specificity and unmatched coverage uniformity across a wide range of DNA inputs, allowing highly sensitive calling of germline and somatic variants while maximizing sequencer efficiency. The NEBNext Direct BRCA1/BRCA2 Panel enriches the complete exon content of BRCA1 and BRCA2 genes for next-generation se­quencing analysis. NEBNext Direct employs a unique hybridization-based enrichment workflow that hybridizes baits directly to genomic DNA, without the need for upfront library preparation. The BRCA1/BRCA2 panel demonstrates extremely high specificity and unmatched coverage uniformity across a wide range of DNA inputs, allowing highly sensitive calling of germline and somatic variants while maximizing sequencer efficiency. Figure 1. NEBNext Direct Workflow. This histogram shows the percent of reads aligned to the human genome, and the percent of reads mapped to the targets included in the BRCA1/BRCA2 Panel across different input DNA amounts. 10 ng, 100 ng and 1 µg of purified genomic DNA was enriched using the NEBNext Direct BRCA1/BRCA2 Panel. 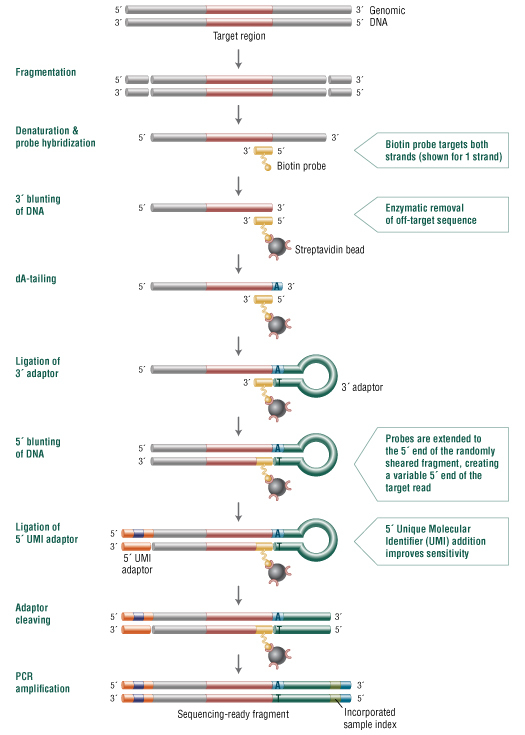 Sequencing reads were generated on an llumina® MiSeq® with 2x75 bp reads, 8 bp Sample ID and 12 bp unique molecular identifier. Sequencing read alignments were performed with BWA-MEM, and PCR duplicates were filtered using the UMIs. This histogram shows the normalized mean coverage across each of the 49 exon targets of the BRCA1 and BRCA2 genes. 50 ng of DNA was enriched using the 17 kb NEBNext Direct BRCA1/BRCA2 Panel. Sequencing reads were generated on an Illumina MiSeq with 2x75 bp reads, an 8 bp sample ID and 12 bp unique molecular identifier. Sequencing read alignments were performed with BWA-MEM, and PCR duplicates were filtered using the UMIs. This figure demonstrates de-duplicated coverage of BRCA1 and BRCA2 genes as a function of sequencing depth across a range of input DNA amounts. Purified genomic DNA was enriched using the NEBNext Direct BRCA1/BRCA2 Panel. Sequencing reads were generated on an Illumina MiSeq with 2x75 bp reads, the 8 bp sample ID and 12 bp unique molecular identifier. Sequencing read alignments were performed with BWA-MEM, and PCR duplicates were filtered using the UMIs. 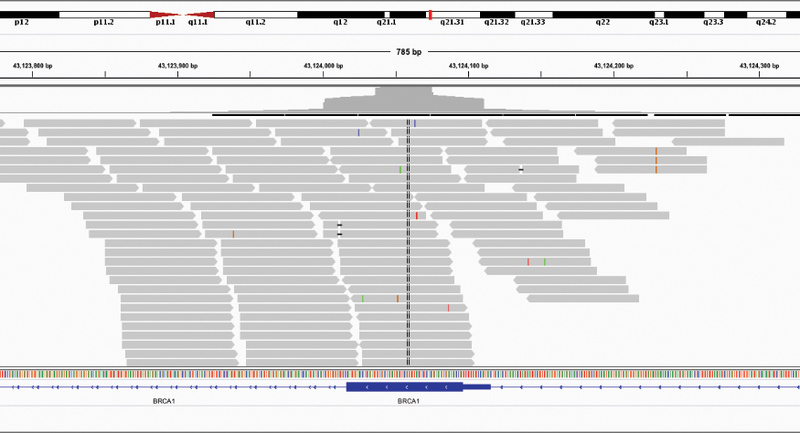 Integrative Genome Viewer (IGV) plot showing the read coverage across exon 1 of the BRCA1 gene. 50 ng of DNA was enriched using the 17 kb NEBNext Direct BRCA1/BRCA2 Panel. Sequencing reads were generated on an Illumina MiSeq with 2x75 bp reads, an 8 bp sample ID, and 12 bp unique molecular identifier. Sequencing read alignments were performed with BWA-MEM, and PCR duplicates were filtered using the UMIs. The NEBNext Direct BRCA1/BRCA2 Panel for Illumina® is designed to enrich for complete exonic content for BRCA1 and BRCA2 genes for next-generation sequencing on the Illumina platform. This kit contains the oligonucleotides, beads, enzymes and buffers required to convert the desired fragments into a sequence-ready library containing both sample indexes and unique molecular identifiers (UMI). The NEBNext Direct enrichment method can be performed within one day and is easily automated. Each kit component must pass rigorous quality control standards and is lot controlled both individually and as a set of reagents. Lot Control: The lots provided in the NEBNext Direct BRCA1/BRCA2 Panel are managed separately and qualified by additional functional validation. Individual reagents undergo standard enzyme activity and quality control assays. Functional Validation: Each set of reagents is functionally validated together through construction and sequencing of a target enriched DNA library on an Illumina sequencing platform. For 100 ng of NA19240 DNA input and an average coverage of 100X, 100% of the targets are covered. For larger volume requirements, customized and bulk packaging is available by purchasing through the Custom Solutions Team at NEB. Please contact [email protected] neb.com for further information. Where can I find the detailed FAQs for the NEBNext Direct® BRCA1/2 Panel? ILLUMINA® and MISEQ® are registered trademarks of Illumina, Inc.
EPPENDORF™ is a trademark of Thermo Fisher Scientific. LOBIND® is a registered trademark of Thermo Fisher Scientific. AGILENT® and BIOANALYZER® are registered trademarks of Agilent Genomics.